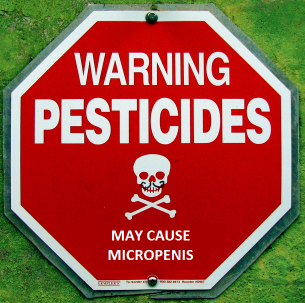 A 2012 study, published at the International journal of Andrology, reveals that pesticide misuse highly increases the risk of males to be born with the micropenis condition and/or other genital malformation(s). Most pesticides contain certain endocrine-disrupting chemicals which -prior to the study- were thought to increase the likelihood of genital disorders. The study's main aim was to assess whether this theory was true or not. The study was carried out in Northeastern Brazil, an area were residents make widespread use of pesticides. The study lasted for 2 years and in this period a total of 2710 male newborns were examined in the regional hospitals of Campina Grande. The babies were examined for genital malformations (like micropenis, hypospadias and cryptorchidism). In this study the ratio for micropenis was 0,66 %. According to the medical literature, the normal ratio for micropenis is about 0,5 %. The difference is about 0,15 %, which may sound low, but it actually means that the micropenis incidence in that area was increased by 30 %. Furthermore, the fact that 92 % of the affected babies were contaminated by EDCS is a clear indication that pesticides played a significant role in the increased numbers of genital malformations. reported some kind of daily activity involving the use of pesticides or other materials containing EDCs before and/or during pregnancy, again a clear indication that EDCs contribute to a higher micropenis ratio. "The high rate of micropenis in our population associated with an elevated percentage of parental environmental/occupational exposure to EDCs before/during pregnancy indicates that foetal contamination may be a risk factor for the development of male external genital malformation."